With food, drink, cool shirts and plenty to cheer about, UW-Green Bay season ticket holders, students, alumni, prospective students and friends, gathered for Krash the Kress on Friday, February 16. 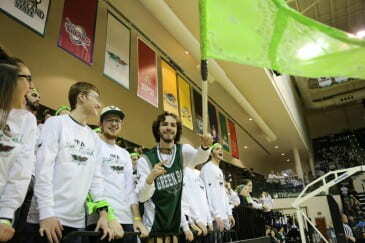 The official sellout was a warm welcome for the Green Bay men’s basketball team playing its first-ever Horizon League game at the Kress Center. In the photos… members of Greek life on campus, the Green Bandana Brigade, the always spirited Pep Band, a view from above, and more.. This entry was posted in Event Photos, Photo Memories, Photos and tagged Kress Events Center, uwgbkrashthekress on March 5, 2018 by moodyk.